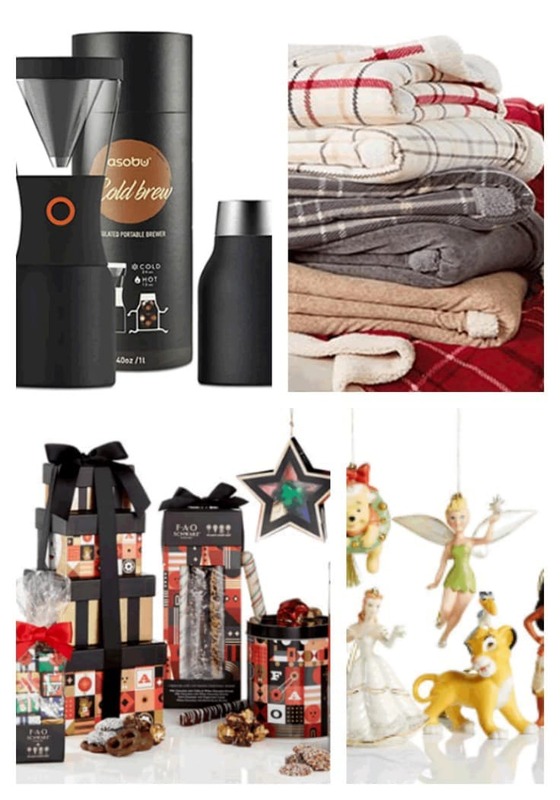 Macy's Gift Guide - Find Last Minute Deals Here for Hostess, Home & More! Macy’s Gift Guide – Find Last Minute Deals Here for Hostess, Home & More! This post is sponsored by Savings.com. As always, all opinions are 100% mine. The holidays are fast approaching but it’s not too late to snag some amazing selections from our Macy’s Gift Guide. Find last minute deals here for the hostess, home and more. I don’t like to attend a party or dinner empty-handed, do you feel the same way? I am always on the hunt for a unique and affordable hostess gift. I also like to give gifts for the home that everyone can enjoy. Right now at Macy’s, you can get free shipping with a $25 purchase through 12/13 (excludes furniture and mattresses) plus $10 in Macy’s Money for every $50 you spend, now through 12/18. Macy’s Gift Guide – Find Last Minute Deals for Hostess, Home & More! I love anything from Martha Stewart and love to give gifts from her collections. These Sherpa Throws look so warm and cozy and they are reversible with several color selections. Paired with a mug and hot cocoa they make the perfect family or hostess gift. Iced coffee is all the rage right now but if not made properly, it can be bitter. This portable, hassle-free BPA free brewer will make amazingly fresh brewed iced coffee at home and on the road. It features a 40-oz. capacity insulated carafe that is airtight and leakproof and keeps your iced coffee fresh for up to 24 hours. Know someone who uses essential oils or is into aromatherapy? If so then you have found the gift for them. I love my diffuser. This one is so nice looking and comes with a starter kit of oils. It has up to 7 hours of continuous operation and will deliver a fine mist along with light and sound modules. Added bonus, it also comes with a remote control. Right now, you can get this beautiful aroma diffuser at a great price! For Disney fans everywhere, these beautiful ornaments would make a unique gift and a treasured addition to the Christmas tree for years to come. It is surprisingly affordable too! Delicious treats are always a wonderful hostess gift and one that the whole family will get excited about. You can find a variety of Dylan’s Candy Bar items from the FAO Schwarz Collection on sale now at Macy’s. They are beautifully packaged too! Macy’s has wonderful gifts to choose from and the sale going on right now has some of the best prices I have seen this whole crazy season! There is no reason to wait. Decide if shipping or in-store pickup is best for you and finish up your shopping with a flourish! You can find even more gift ideas from Macy’s when you follow the hashtag #LastMinuteMacys on social media.